Filed under Potpourri, Television; 3 comments. The comedic television show Cheers left a legacy of not just 28 Emmy Awards but also of a place "where everybody knows your name": a simple bar in Boston, populated by a variety of memorable characters and their antics. When founding cast member Shelley Long first stepped foot on the show's set, she found herself transported to a bar she'd visited in Boston. Sure enough, the faux bar was modeled after an actual one: the Bull & Finch at 84 Beacon Street, on the north border of the Boston Common. The pub rechristened itself Cheers in 2001, to capitalize on the success of the show. Its owner opened another location in nearby Faneuil Hall, built to closely resemble the television's set, as most Bostonians know by now that the original Bull & Finch has a dramatically different layout from its more popular fictional sibling. 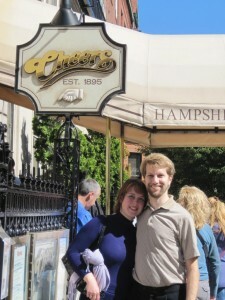 Fortunately, my guests for lunch were not like most Bostonians: with four Cheers fans from Melbourne, Australia, and my Missourian girlfriend who'd never seen the show, I figured the pub would be a good place for a quick bite to eat en route to the airport. This sign, seen at the opening of every episode of Cheers, greets visitors to the former Bull & Finch. We arrived around 12:30 PM on a beautiful Saturday in early October, expecting a long wait for a table at this busy tourist destination. Buzzer in hand, we milled about the top of the stairs that led to the rathskeller, taking turns posing in front of the exterior used in the show's opening shot. After only 15 minutes — half the time the maitre'd had estimated — we were directed to make our way to the rear of the restaurant to the "Back Room." My traveling companions had several unwieldy suitcases with them that made this navigation a chore, but though they surprised our server, she quickly collected herself and showed us to a staff room where the bags could be left while we ate. Like the layout, the bar's atmosphere was also unique from that of the show. Our corner booth had intimate lighting, but the noisy atmosphere of other diners close enough to touch and several widescreen televisions sometimes made it difficult to be heard. The room was decorated with local mementos, referencing everything from pilgrims to Celtics but with few appearances by Sam Malone, Coach, or its other televised employees.